My little family and I are hoping for a white Christmas this year, and with all the snow that has fallen recently, I'm sure we're going to get it! Our normal Christmas day is hot, dry and it always involves the beach and most often a barbecued breakfast. A cold, white, "traditional" Christmas - like we have seen for years in all the movies - will certainly be a big change for us as well as a fun novelty. We are very excited. Being away from home means we are also away from our "stuff". Our Advent Calendar is rolled up in one of a hundred storage boxes (I made a new one last year but didn't get time to blog about it - here is one I did a few years ago), along with our Christmas stockings and our decorations. I know I could've easily bought an advent calendar and stockings but one of the lovely things about living here is I've had a bit more time than I normally have at home (no school runs, no work and I have family living right next door = ideal) so I decided it would be nice to make a few things. I went with a very basic stocking design. I drafted the shape of a stocking onto some tracing paper (actually it was baking paper - gotta use what you've got!) and used a very rustic hessian (burlap) as my material choice. 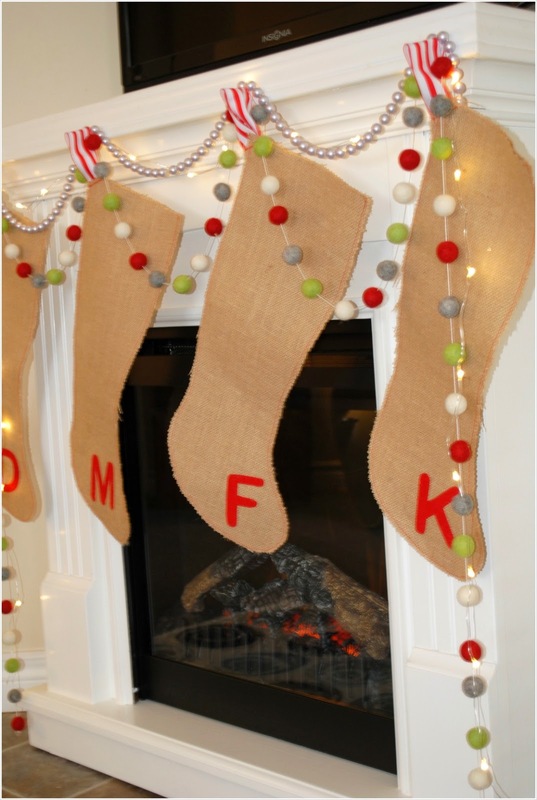 So that Santa can differentiate whose stocking is whose, and so that I don't end up with Lego and Playdough, I cut out our initials, using a bright red fabric, and sewed them on (you could also just stick them on but I like the sewn look and hope they will last longer). I then just attached a loop of ribbon and sewed them right up - seams on the outside, raw edges 'n all! I neatened the edges with pinking shears. I have no idea whether they will fray or not - I'll let you know next year. They are plain and they are simple - I love that. 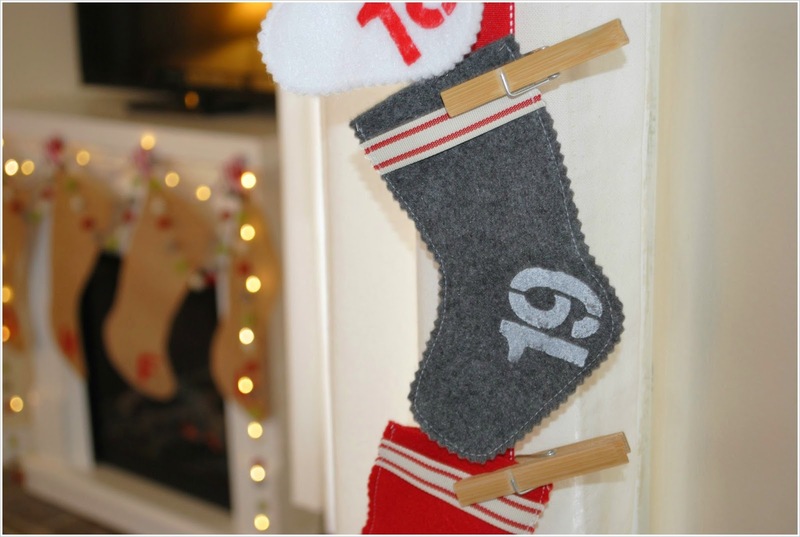 For the Advent Calendar I used my very good friend's (aka Martha Stewart) mini-stocking idea which was not only cute but really easy to pull together. She has a great tutorial on her website so although today is December 1st (the official start date of the Advent Calendar, but not necessarily what has to be done), you could probably whip some up in no time at all - even if not for a calendar but for decoration, or for gift giving. Martha suggested using metal tags for numbering but I couldn't find any at Michael's so I stencilled on the numbers instead using a Handmade Charlotte stencil set that I already had. To be honest, I probably would've gone with slightly smaller numbers but because I already had a numbered set I didn't want to go and buy another ... and I'm impatient and wanted to get on with it! I used a white acrylic household paint for the grey and red stockings and a red craft paint for the white stockings - again, just using what I had laying around. I wasn't sure whether I would pop them all in a basket, hang them on our tree or attach them to the wall somehow. In the end, I decided to peg them all from a ribbon that is hanging from each side of the window. There's not a whole lot of wall space in our little cottage so hanging them vertically works well for us, and it's nice to have them on display, looking all fun and Christmas'ey. I will be using A Little Delightful's advent cards again this year, for about the fifth year running. I don't use all of them but Bianca also includes blank cards in her printables so you can write your own advent activities (thanks Bianca!). I probably use the blank ones the most. This year I will be including a few treats (I just bought a small bag of the red Lindt chocolate balls), a few little inexpensive gifts (that the kids need to hunt for - the note in the calendar gives them clues), activities (Christmas craft, reading a Christmas story etc) and on the 24th they always get a new pair of pyjama's - this is for totally selfish reasons ... so that they look cute in the photos on Christmas Day! It's a Mumma's prerogative, you know. I also had the urge to make a felt ball garland. I have had a bit of a love for felt balls for quite a while now and I knew that a garland of balls would be quick and easy. I ordered 80 of the balls from Craft Wool Felt on Etsy and chose some colours that I liked and that worked with my stockings and calendar. It came together in about 15 minutes - I just threaded the balls onto white embroidery floss, made a knot at both ends of the garland and that was that. I didn't bother knotting after each ball - the balls pretty much stay where you put them but if one should move you can just slide it back in place. It really couldn't get much simpler, and I love the way it looks on the fireplace mantel. I'm just so excited to have a fireplace and mantel that I can hang stockings from - it's just so traditionally Christmas. And once the snow falls again and the place is all white and soft and fluffy, I'll be all overcome with the spirit of Christmas! 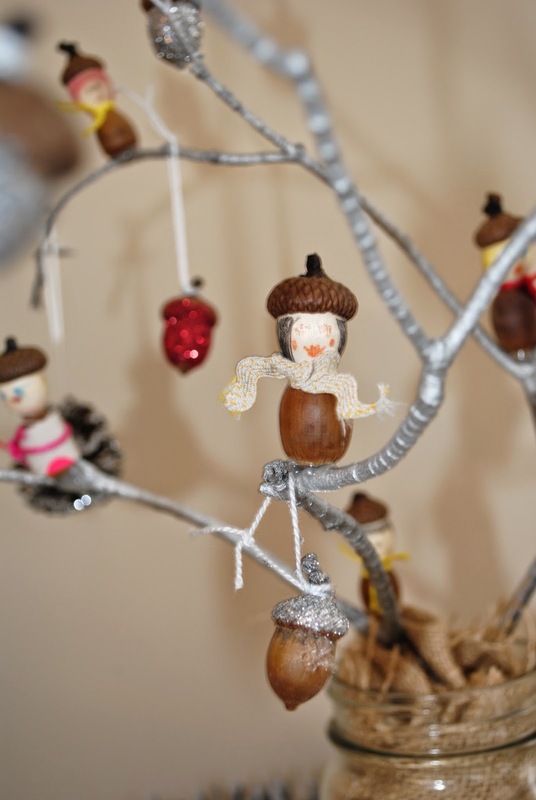 Oh, and we spray-painted some branches and hung our favourite little acorn decorations all over them and then decided our little acorn people needed a home too, so we added them in as well. From all reports they are very happy with this new arrangement. Oh yes, it is definitely feeling very much like Christmas around here! What's happening at your house this year? 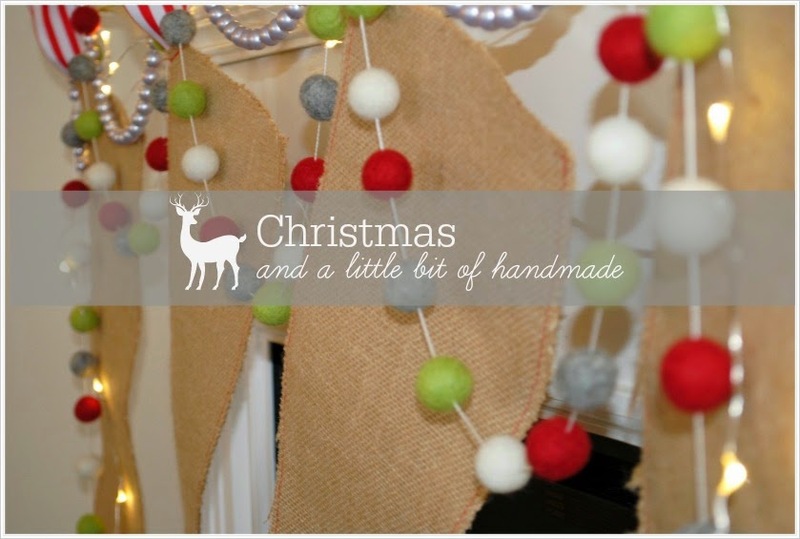 Do you DIY any of your decorations, or do you prefer the beauties that are in the shops? Ohhhhhh, there are some lovely ones, isn't there? Do you do an Advent Calendar with your kids? Do you have any special traditions? I'd love to hear what they are. Wow, your decorations are stunning! I hope you got your White Christmas! Oh I love your handmade Christmas, it's beautiful!